The quad-band GSM ASUS V80 phone features a 2.0-inch TFT LCD with 176 x 220 resolution, a 2.0 megapixel camera with auto focus and macro mode, flashlight and horizontal photo features. The V80 from ASUS also includes Bluetooth, enabling you to connect your phone to various Bluetooth-enabled devices such as a printer to print directly without having to use a PC. 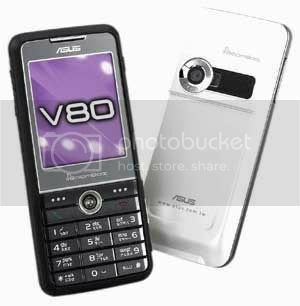 The ASUS V80 phone also offers features such as MP3, MPEG4 video record, FM radio, speaker amplifier, flight-mode and song lyrics. The V80 also includes the QR Code scanner and barcode decoding software as well as 55MB of built-in memory which is expandable via the incorporated miniSD memory card slot for additional storage.